Marseille striker Mario Balotelli scored the winner in a 1-0 home victory against Nice on Sunday and he celebrated in some style. The Italian star lined up against his former club for the first time since leaving for the Orange Velodrome in January, after falling out with French head coach Patrick Viera. The two men played together briefly at Manchester City and it was hoped that they would enjoy success together in Nice, but Balotelli’s contract was terminated after he was banished from training by Viera. The 28-year-old has hit the ground running at Marseille since signing a six month deal with the club, scoring five goals in seven appearances and hitting the headlines for an outrageous Instagram live celebration after netting in a 2-0 win against Saint Ettiene. Balotelli’s debuted another new celebration following his latest goal against his old employers at the weekend, sitting down to play rock, paper, scissors with his teammates. 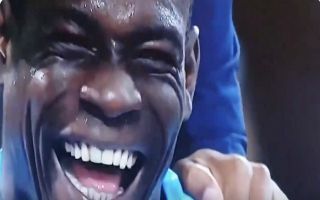 Check out a video of the unorthodox celebration which is sure to bring plenty more attention Balotelli’s way below, via Twitter.